Dancers take part in Baishakhi Mela cultural programs during Bengali New Year celebrations in 2017 in this Beach Metro News file photo. 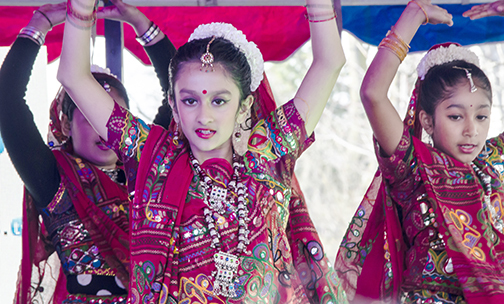 Bengali community members will be celebrating Bengali New Year this Sunday, April 14, in the Victoria Park and Danforth avenues area. Everyone is welcome to attend the celebrations which will begin with a gathering at the Shoppers World, 3003 Danforth Ave., parking lot at 1:30 p.m. The rally and march goes from 2 to 3 p.m. with participants walking along the north side of Danforth Avenue heading east towards Dawes Road. They will then proceed back from Dawes Road to the Shoppers World parking lot. “The rally members will be holding colourful banners saying Happy Bengali New Year’s,” said Borenda Sanyal, General Secretary of the Canada Hindu Mandir who are organizers of the celebration. Bijit Roy, President of the Canada Hindu Mandir, said the first celebration in the Victoria Park and Danforth area took place in 2012 and the number of participants has increased since then. Local politicians including Beaches-East York MP Nathaniel Erskine-Smith, Beaches-East York MPP Rima Berns-McGown and Scarborough Southwest MPP Doly Begum are expected to attend Sunday’s celebrations. At the end of the march, community members are invited to attend Baishakhi Mela cultural programs taking place at the Mandir located at 16 Dohme Ave. in East York.